A fresh Tomato Salsa is so easy to make, you hardly need a recipe to make Tomato Salsa! Mild in a flavor with a kick. Tomato Salsa only takes few handy ingredients to create this basic recipe. 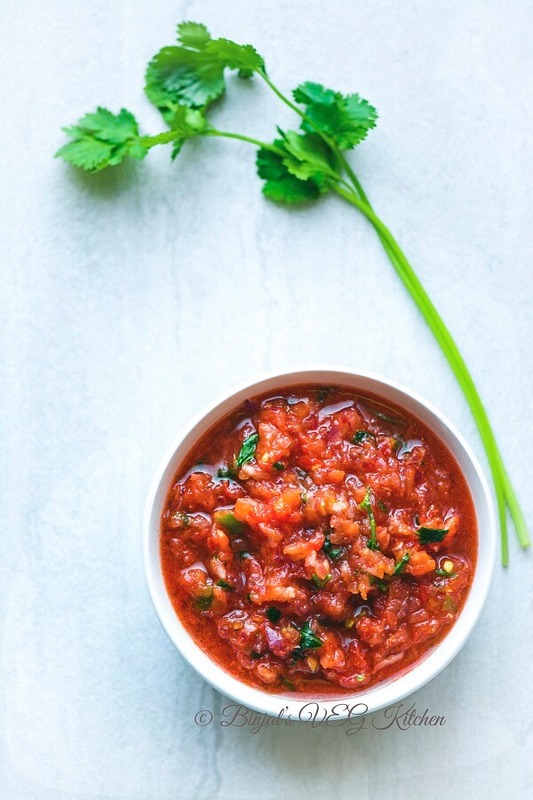 Keep it fresh by mixing fresh chopped tomatoes, onion, jalapeno, and cilantro with lime juice for a quick and simple salsa. This is just the basic recipe to tickle taste buds with garden-ripe flavors and homemade goodness! 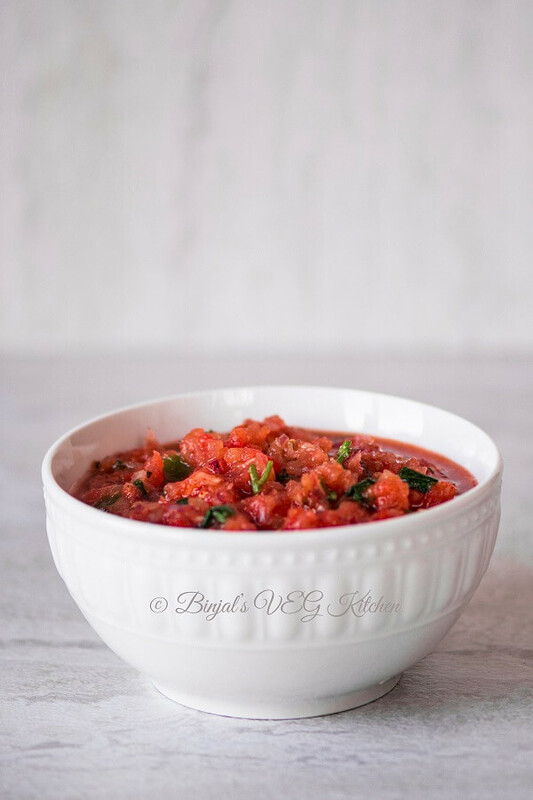 This fresh and healthy tomato salsa recipe is perfect for any snack, easy to prepare, it is a great for dipping or as a side dish. You can make it jar full quantity and then refrigerate until need to serve. 1. Add 1½ cup chopped tomato, chopped onion, garlic, chopped jalapeno, salt, black pepper powder and red chili powder in a blender and blend it for a minute. 2. Now add remaining/leftover chopped tomatoes, cilantro and lime juice in the blender and blend it for few seconds to make coarse mixture. 3. Our Basic Tomato Salsa is ready, serve it with chips, nacho or as a side. 4. You can serve this salsa with burrito or taco too. • You can store it in a refrigerator for up to a week in air tight jar. • You can use caned diced tomatoes. A fresh Tomato Salsa is so easy to make, you hardly need a recipe to make Tomato Salsa! Mild in a flavor with a kick. Tomato Salsa only takes few handy ingredients to create this basic recipe. Add 1½ cup chopped tomato, chopped onion, garlic, chopped jalapeno, salt, black pepper powder and red chili powder in a blender and blend it for a minute. Now add remaining/leftover chopped tomatoes, cilantro and lime juice in the blender and blend it for few seconds to make coarse mixture. Our Basic Tomato Salsa is ready, serve it with chips, nacho or as a side. You can serve this salsa with burrito or taco too.